The Seinfeld "New Yorker cartoon": "I wish I was taller." 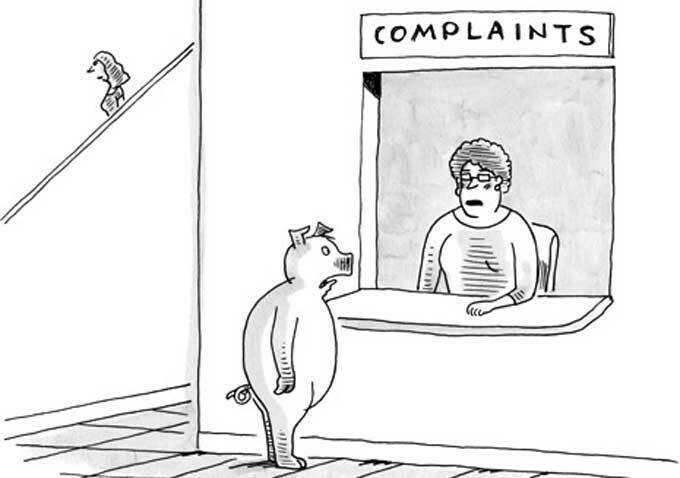 I'm thinking that maybe the New Yorker's Cartoon Caption Contest has it backwards. "Each week, we provide a cartoon in need of a caption," the instructions begin. Too many weeks, the captions are in need of a cartoon. For the contest to work, the art should be just begging to have something smart written under it. Every few weeks the contest works. But most of the cartoons sit there stupidly, the cartoonist having tossed in some incongruity passing for wit, or at least the kernel of wit. The August 26 New Yorker just came in the mail, and I turned to page 74 to see if this was one of the good weeks. It's one of the worst. In "This Week's Contest," some Incredible Hulk type in a yoga studio is slamming a bald guy into a wall. Go for it. Make that funny. "My name is Gary, and I'll be annoying you." The only excuse that can be made for such limp, obvious submissions is that they had nothing to inspire them. Which I believe is a feeble variant—if even that—on a joke about golfers and wives that's been around since the game began in Scotland. At the New Yorker, where it is vital to maintain the illusion that its readership is incredibly special and incredibly sparking, this should be a fall-on-your-sword moment. Resignations alone would not suffice, though scrubbing the Cartoon Caption Contest before more harm is done would make a good start.